Yesterday I was writing a sales page for a new program I’m offering. It wasn’t a particularly complicated job so I didn’t think it would take long. In fact, I sat down to write at 8am and figured I’d be done and sipping a congratulatory Starbucks by 10am at the latest. 10am came and went and I wasn’t nearly finished. The writing was going so painfully slow that I felt like banging my head on the keyboard. I couldn’t figure out what was wrong. Why was I struggling to write this thing? Why couldn’t I figure out what to say and how to say it? Why couldn’t I get this damned thing done? Pretty embarrassing for a guy who wrote a book on copywriting! Now one of the advantages of writing copy for your own business is that you can give yourself a deadline extension! But I really didn’t want to do that. I needed to get the thing done. That day! Fact is, I get asked this question all the time in workshops. Here’s how I answer it. Clearly visualize the prospect sitting across from you. Decide what you need (not want) to say and the key points you need to make. For some reason, I wasn’t doing that. I got caught up in “gotta get it done” panic and forgot those basics. So I took a breath. Relaxed. And followed my own advice. It did. Almost immediately. 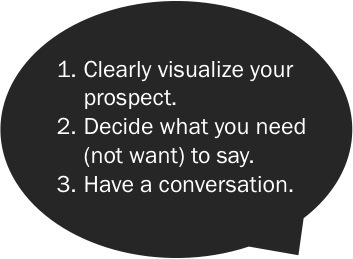 Once I visualized my prospect clearly, I was able to figure out what I needed to say about my program and, more importantly, the questions a prospect would likely ask. I was able to finish the sales page in about 40-minutes after taking that approach. You’re right, Steve. Some days the words just don’t want to come. Next time that happens, I’ll use your suggestion. Thanks for sharing the process. My pleasure, Annie. If you have any writing productivity tips to share, please do. Thanks for an awesome article Steve! This helps me two ways … 1) to stay “in the conversation” instead of rambling on … and 2) to look at my writing as conversation rather than me just talking. This is an aha! moment for me. Thanks Becky. I’m glad you found the article helpful! Steve, you’re a mind-reader. I was struggling with this precise problem today, and avoiding my sales copy like it was a bill collector. Now I’m looking at you. And you’re smiling. And we’re just having a chat. So I just want to tell you, I’ve been watching you for years now…especially since we’re both Canadians. And you should know how much your work has meant to me–all that it has taught me, simplified for me, and well, inspired me. And now, if you don’t mind, I need to go write a press release! Thank you for letting me know that I’m not the only “veteran” who gets these weird blocks, and, more important, for releasing me from my torments. Thank for that, Chet. Coming for an established pro like you, that means a lot! I’m sitting at my computer right now looking out the window. I think it’s time to try your suggestion. When writing something, beware of brainstorming, planning, outlining, etc, any of which could be procrastination, cleverly disguised. I was listening to a webinar last night with David Garfinkel, Brian McLeod and Richard Armstrong (which is where I got the tip that for learning B2B copywriting, Steve was a great guy to study). During the call Richard made the point that a key factor in so called “writer’s block” is simply that you haven’t done enough research beforehand. Which guess is a good precursor to this technique. Thanks for sharing that, Simon. Knowing what you need to say (and you find that out through research and thinking and then, perhaps, more research) makes it a lot easier to say it. Conversely, trying to figure out what you’re going to say as you’re writing makes the writing process painfully slow. I thought I’d share a “classic” that I only recently discovered: A Technique for Producing Ideas” by James Web Young. Glad you’ve changed “painlessly” to “painfully” on your blog. I’d suggest you substitute “slowly” for “slow,” but I’m not too old-old-school to realize language usage evolves. Thank you, Steve, this blog smacked me right between the eyes. Those creative juices so badly need to flow – the view from my window is great but nothing’s getting onto my Word document.